Brie by ‘gum, Yorkshire loves its cheese! 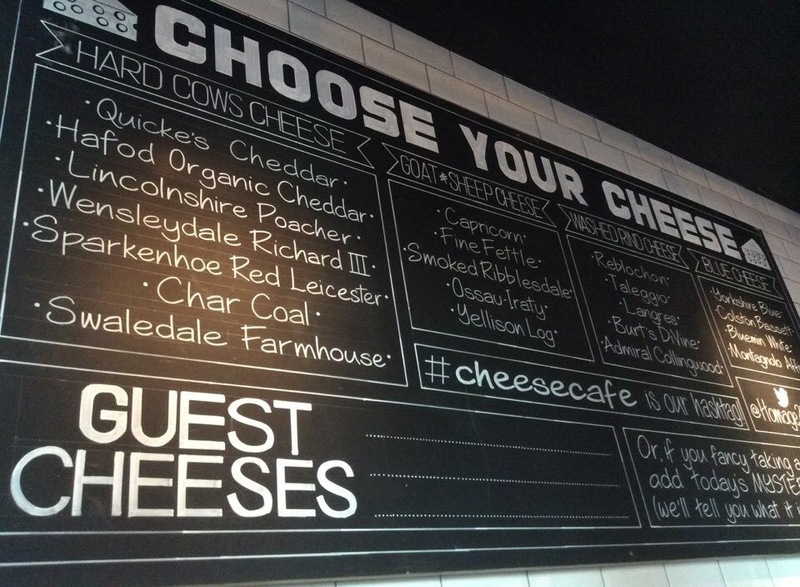 Not content with monthly cheese clubs, Leeds has decided to go all the whey (yep, a cheese pun – get used to it) and the wonderful pop up company Homage2Fromage has set up shop in the LAB bar, owned by the Jones Bar group who already successfully run Roxy Lanes Ballroom, Hirst’s Yard and Brooklyn. And it looks like they have another Gouda venture on their hands – you’d feta believe it (ok, I’ll stop…these puns are starting to grate….ahem…). 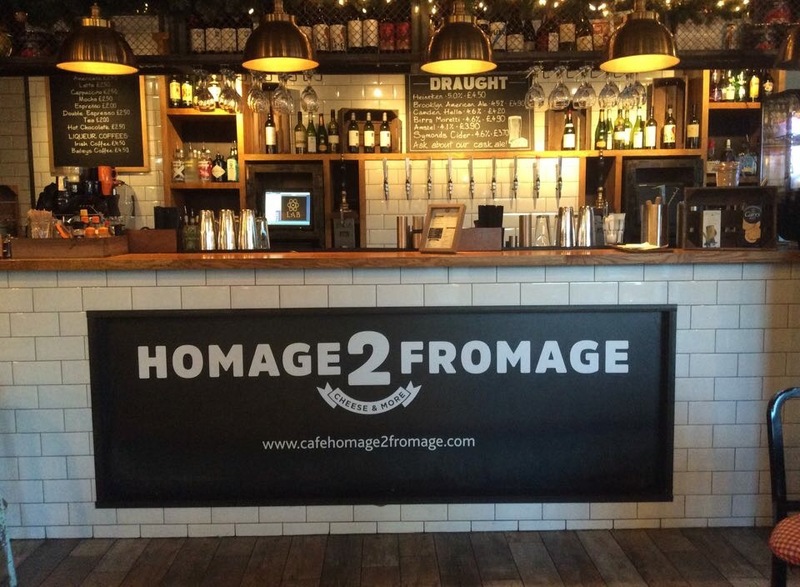 For a six month pop up, Homage2Fromage are serving the greedy mouths of Leeds the height of sophistication and variety in cheese, in stylish and relaxed surroundings. 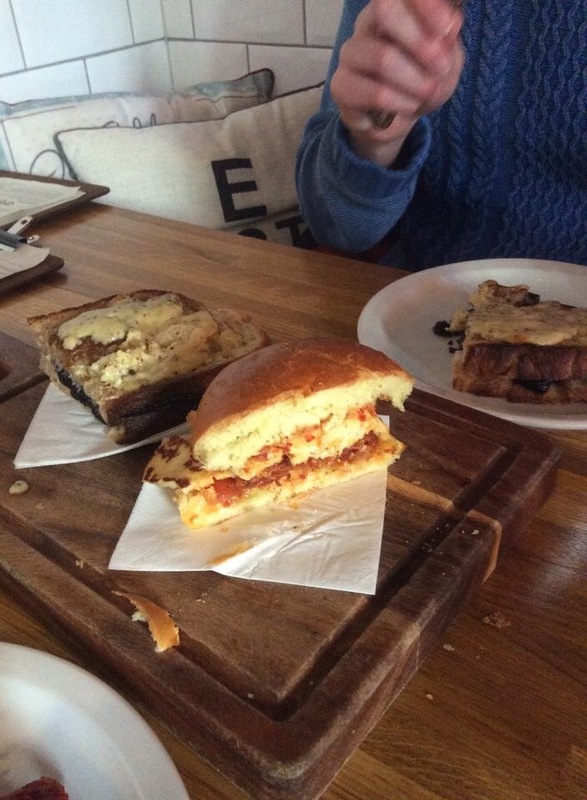 I popped in with my friend to check out their menu and we were definitely not cheesed off with the results (someone – please help me: I have a problem). The restaurant offers an extensive menu that boasts small plates as well as larger dishes to share. 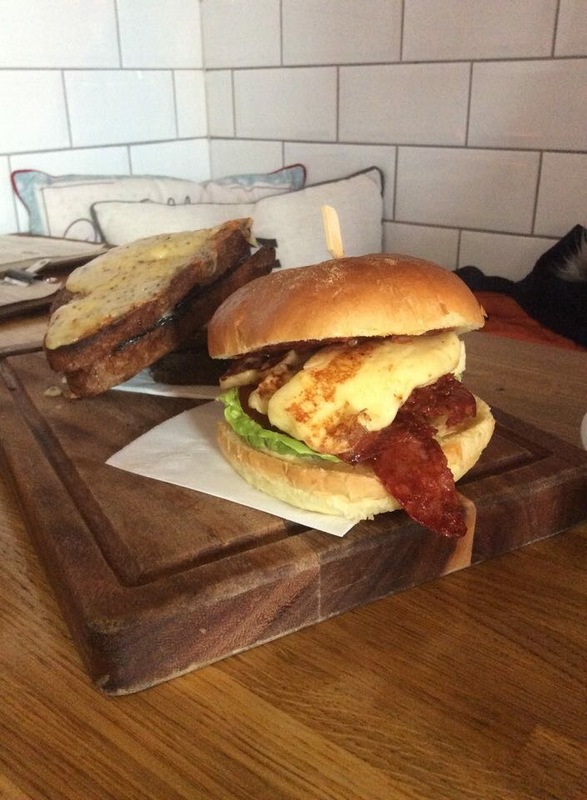 The prices, especially for the small plates were extremely reasonable, and we opted for a Yorkshire halloumi slider with chorizo and a Yorkshire Rarebit. Now both my friend and I are particularly greedy and I have to admit, whenever I see the phrase ‘small plate’ I think ‘Well I’ll need about three of them to be satisfied’. Wrong! My halloumi slider was normal burger size in a delicious brioche bun, packed with thin chorizo-bacon, salad, pickles and hummus. I cut it in half to share and was more than satisfied with the size. The salty, squeaky halloumi, piquant pickles and peppery chorizo was mouth-watering and enough for a filling lunch for one. The Yorkshire Rarebit came with a great little story on the menu, and was huge! The sourdough was grilled to crispy perfection, with unique charcoal cheese inside and Yorkshire cask cheese on the outside. For a real cheese-hound, this would be an ideal lunch and again, wonderful value. Much more than just a small plate. Full already, we decided to be even more greedy and plumped for a fondue. 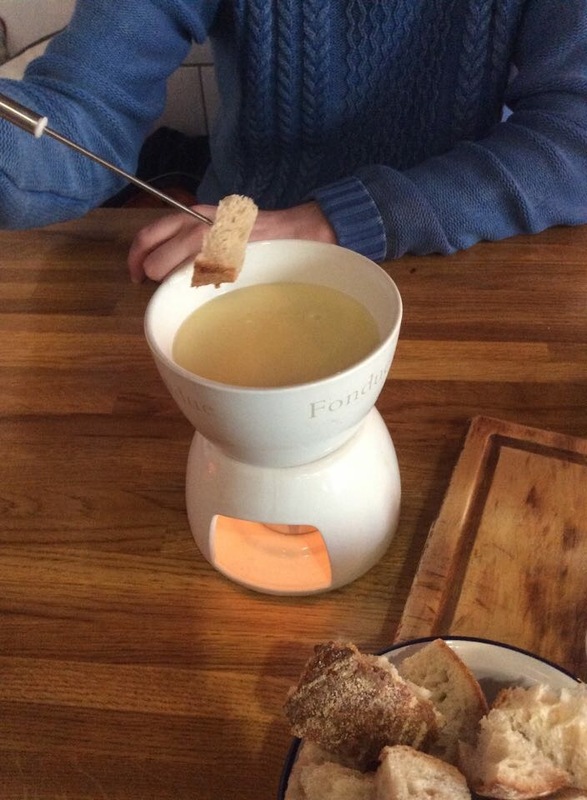 My friend and I were both cheese fondue virgins so were curious as to the taste, even though we were still pretty full from the ‘small’ plates. Our fondue arrived, with the necessary bread sticks, slices of sourdough, cornichons and sauteed vegetables, and looked the piece. We were only missing the snow and poser skiers because we were transported to Switzerland in the guise of molten garlicky cheese. Full to the eye balls with cheese, we managed to work our way through the vegetables, pickles and sourdough, dipping into the fondue and groaning in fromage-induced delight, thanking sweet baby Cheesus (so sorry!). 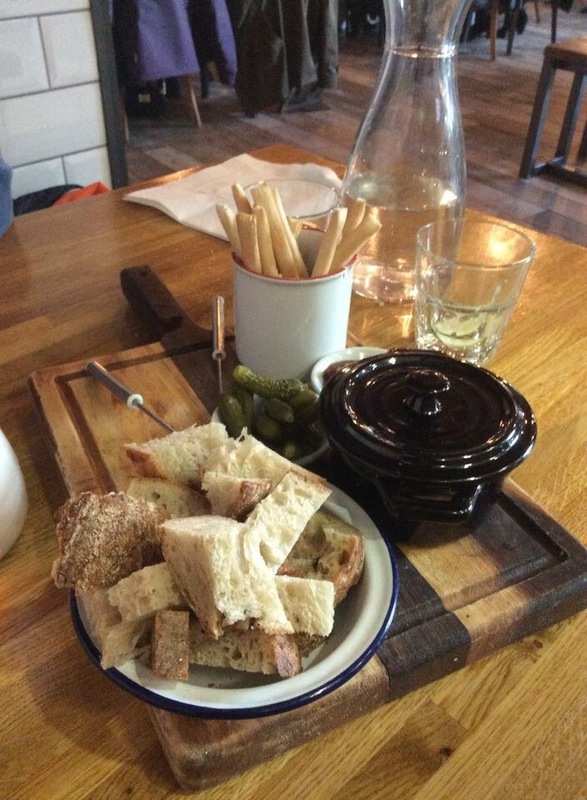 They also offer raclette, baked brie as well as plenty of other delicious sounding small plates, but we had definitely had our fill, and not wanting to fall deep into a cheese-based coma, we had to stop. The staff were incredibly friendly and knowledgeable about the cheese, able to offer insights into individual tastes and flavour combinations. I’m already planning my next visit. I get the feeling that this pop-up might not be popping down for a while – in fact a member of staff said that if the demand was high enough, they’d stay for longer. So what are you waiting for? Get down there and get your cheese on! Sorry – hit the wrong button AGAIN!!!! Sorry, obviously my Get The Glow post is nowhere near finished yet and still in its early stages, but yet again I have pressed the wrong button and its gone out to you. It’ll be ready soon, I hope. SORRY, just pressed publish instead of SAVE!!!!! It will be finished and published ASAP!!! This is not so much a food post, but just a general one. I started writing about my intentions for the year, but have snaffled a similar idea to the lovely Amy Elizabeth’s post, just because it looked so much better!! I hope you don’t mind. 2014 was a year of change for me, it started off with becoming increasingly tired of juggling crazy teaching hours, work load, blogging and life in general, to becoming a part-timer and not being able to blog as much. In my personal life, there has been much change too, with many people who I am very close to that I miss every day, mainly because of life getting in the way and distance. Scattered throughout, there were many amazing things which happened as well, so Iife definitely could’ve been much worse, but there’s always room for improvement. I’m not one to make resolutions normally, because I’m rubbish at sticking to them plain and simple! However, I must say that I do have the best intentions at the start of a new year to improve though, hopefully I’ll remember not to beat myself up about it if I dont succeed at them all. At home, eat less junk and cook more. Run the Berlin marathon, without injuries this time. Take time to catch up with friends more often, near and far!! Travel more and explore new places. Listen to advice and take more onboard. Not to worry too much about blogging all the time, be more choosy and write better. Do you have any new year’s resolutions or good intentions to set yourself this year?